QUIPSinfant (QUIPSI)/PAIN OUTinfant is a web-based international registry providing clinicians with tools to carry out audits and to receive feedback of pain related outcomes in children after surgery. QUIPSI has been running since 2011 in German speaking countries. Interest in QUIPSI from healthcare providers treating children outside Germany has led to developing a version that can be implemented internationally, PAIN OUTinfant. The non-for profit project is supported by several scientific societies. Children after surgery between 4 and 18 years are asked about their postoperative pain therapy and possible side effects. Pain assessment is done from the patient's point of view, using the validated‚ Faces Pain Scale - revised by Hicks et al. and a standardized instruction on how to use it. As a valid data collection is of high priority a detailed training course and written guidelines on the standard operating procedures are provided. The QUIPSinfant registry includes 6043 children and adolescent. Forty one percent were female (n = 2458). The mean age of all children and adolescent was 10.2 ± 4.0 (f: 10.7 ± 4.0 m: 9.9 ± 4.0). Median duration of surgery was 42 min (IQR: 24 - 80 min, f: median 45, IQR 25 - 90; m: median 40, IQR 23 - 73). 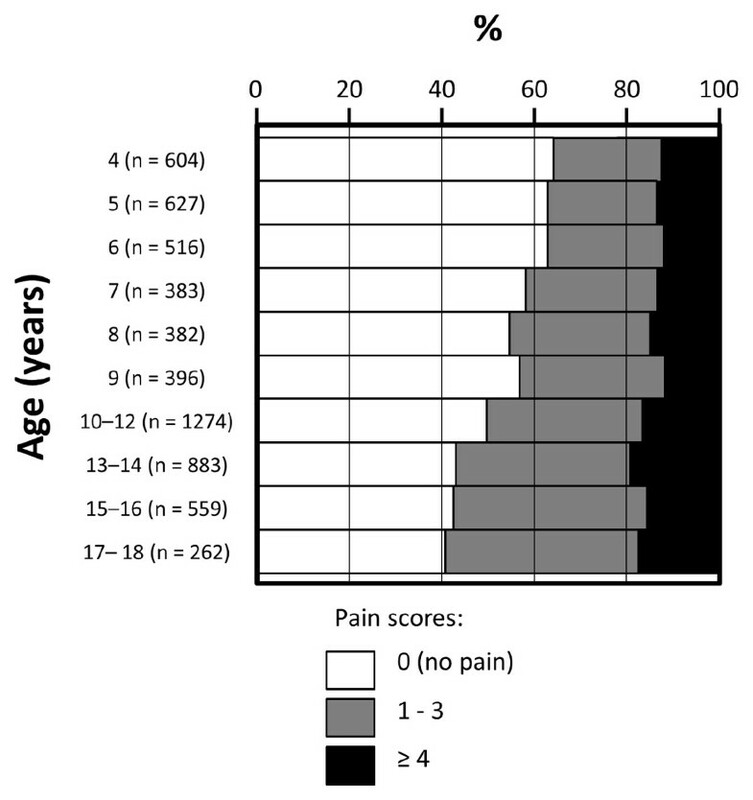 About half of the children and adolescents reported no pain at all (52.8%) and 15.3% reported clinically relevant pain (pain ≥4) (Figure 1). Also about half of the children and adolescent reported tiredness during the day (52.6%), 24.2% reported nausea and 17.1% vomiting. Percentage of children without pain, with pain without need for medical intervention (1 - 3) and suffering from clinically relevant pain (≥4) for different age groups (n = 5886). Despite improvements in pain management in recent years a significant number of postoperative children and adolescent still suffer from pain and possible side effects. Therefore, in hospitals a standardized assessment of pain and possible side effects is necessary to identify areas of improvement.